I know it's obvious: my favorite color is yellow. I love decorating with it and I love the burst of energy it automatically gives me. I wanted to bring this pop of color and welcome spring with a lemon wreath! 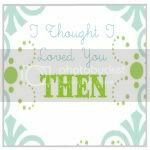 I'll attempt to share how I did this since there isn't a proper tutorial on blogland (SHOCKER!) and I had to practice myself so I figured I might as well save y'all the mistakes! Measure out spacing. Decide if you want your lemons to go in a certain direction or not. I'm pretty OCD and quite the perfectionist-I think it helped during the planning stages. I alternated between large and medium lemons (both came in the pack of lemons I bought from Tj Maxx). Not using the mini lemons just yet! You can start to see the size difference here. Large, medium, large, medium, large... you get it. Take your MINI lemons and start using the same clean line (close together, one way gluing) on to the wreath under the large/medium line you just did. The package of mini lemons comes with a lot of odd shaped lemons, almost like kidney beans. Save those in a separate pile. They make PERFECT "filler" lemons for tricky spots. For now, used the most "normal" mini lemon to complete the inner part of the wreath. All filled in! Now to make it "less perfect" and organized looking and more "natural" ! 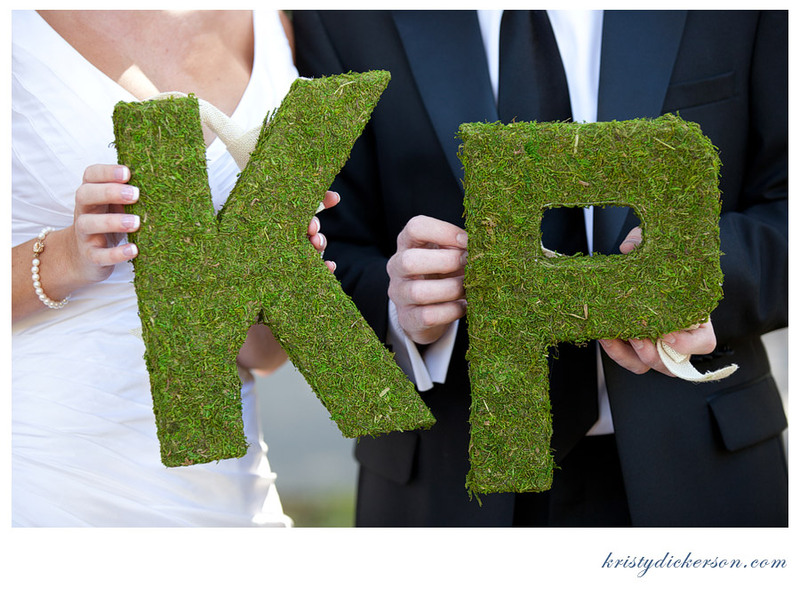 Take your fake leaves and cut them off the stem they came on. Play with where you might put it and decide on a size you need. I decided to cut my leaves in half to match the size of my wreath. Here I am almost done sticking the leaves in...Oh, hello phone. Glad to see you could make an appearance in the tutorial :) I wanted mine more leafy and green so I kept sticking leaves in. You can stop whenever. Time for the "reject" lemons (the misshaped kidney-bean looking ones) and ALSO time to break away from the organized look. Start filling in the gap between the first layer you did and the second with these odd mini lemons. Stick them in any direction. Up, down, sideways... have fun with not having to think about where they should go. And you're done! That's it! EASY PEASY! For under $25, I'd say it looks JUST as good as those expensive ones out there!!! 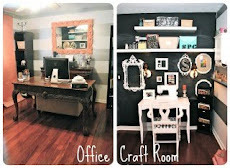 And I had fun crafting in my new office!!! but it's tempting to put this up there NOW! Linking up to the usual parties! Centsational Girl's Best of the Blogosphere! I LOVE THIS! Great job. I need to make one for my door. I still have a UK football wreath up. Adorable. Yellow is totally my favorite. I may try this for my summer wreath. So cute. Visiting from Tatertots and Jello! I love love love this! You did an amazing job! That wreath is AMAZING!! And such a fantastic tutorial. LOVE it!! You are so talented!!! Love the wreath, great job. Where did you find the boxes of lemons? I love this wreath and can not wait to make one of my own! Awesome job and thanks for giving such detail pics of how to do it! I also liked how your dinning room walls match your blogger background. I am inlove with gray, white and yellow right now. I just redid my living room in that color decor. I'm loving this wreath too! thx for sharing! I love that wreath ~ great tutorial too!! thanks for sharing!! SO cute! I need more yellow in my life. love it. my favorite color is yellow too. we even painted our front door yellow. great job! Yellow = spring to me. This is lovely and fresh. Love it! Gorgeous! I cannot wait.to make one. I love it! Love this-you could even use it in your kitchen year round for a Tuscan feel. I love this! Read every step and want to make one for my front door! 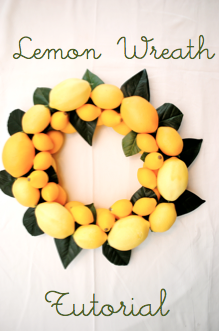 That is most thorough tutorials for a wreath I have ever seen! Wow! Totally bookmarking this for a summer wreath! If you have a moment tonight I'd love for you to share this with my readers: Creative Juice Thursday Party @ Momnivore's Dilemma. Party starts at 8 CST. Hope to see you there! Okay, I just found your blog and I am in LOVE! 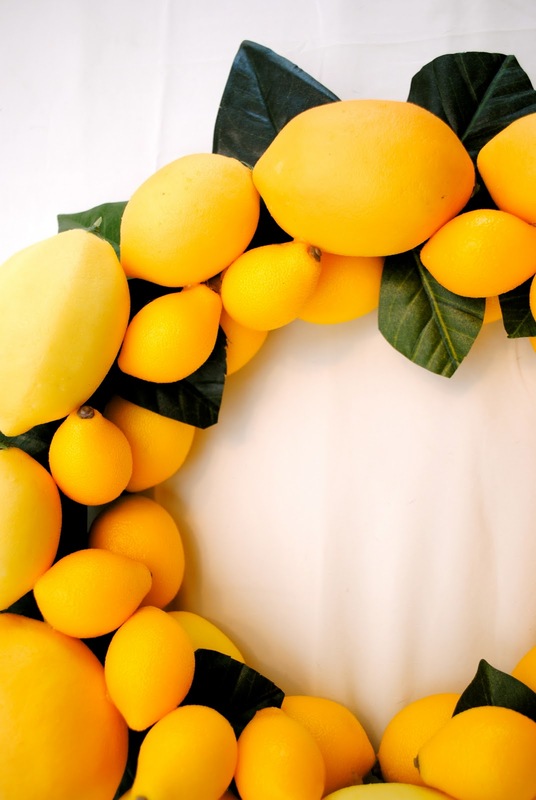 I'm your newest follower and love this wreath. Thanks for the fabulous inspiration. It looks wonderful! Great tutorial! i would love to have that on my door-what a great tutorial, and funny, too! I love it!!!! I want one!! I'd love for you to come link up to Wow Me Wednesday!! 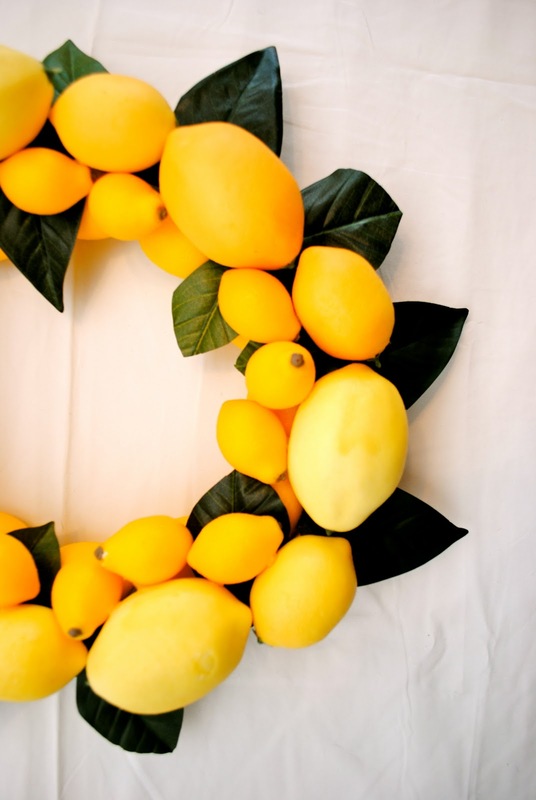 Love this wreath! I'll bet it has a lovely scent. I love it! How much were the lemons? From great green moss letters to a lovely lemon wreath! You ROCK!! It's gorgeous! I'll definitely be making one of these! Thanks for showing us how! I love this, and your tutorial is great! I featured your project on my blog, I hope that's OK. If you'd like, please grab a button! Too bad you can't use real lemons. I have a million growing on my tree. I love the look - great tutorial! This turned out so great! It's so cheery! I love it! great tutorial. OH yes!! I love this wreath! Did I ever tell you about how much I love leMONS:0) beautiful!!! 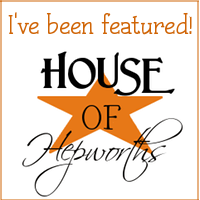 I featured you this week at my Hookin Up with HoH link party! Love this! I just posted a wreath disaster last night with same type of wreath. I think I needed the ribbon. just gorgeous. I love the yellow. The bright fun colors of lemons always make me smile. Love your wreath. You were smart to make your own because the price of store bought wreaths is usually insane. Homemade ones generally hold up better too! Beautiful wreath and great tutorial! I love lemons. Thanks for sharing. oo I would LOVE to do this with oranges. I love Orange! Thanks for the idea! This is so lovely and, of course, my favorite color to boot! Saw your comment on All Things Thrifty. 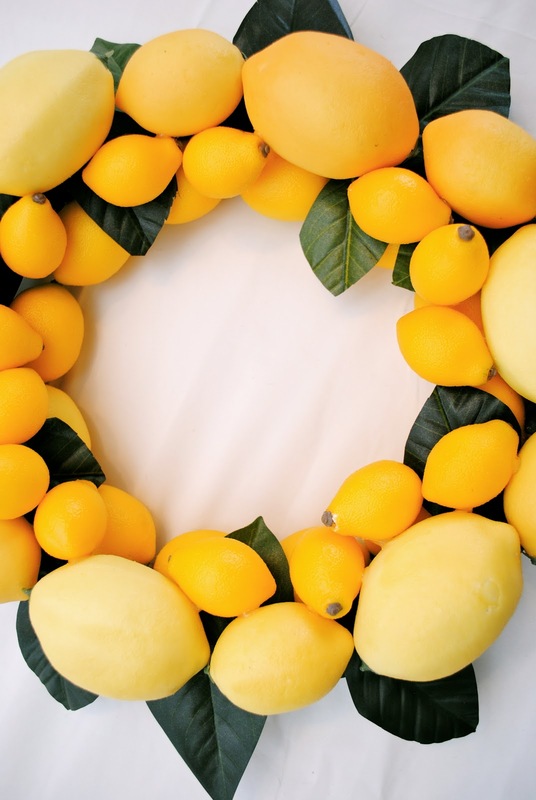 Love this lemon wreath! Great job and thanks for sharing!